Ah, the sweet smell of surprise. 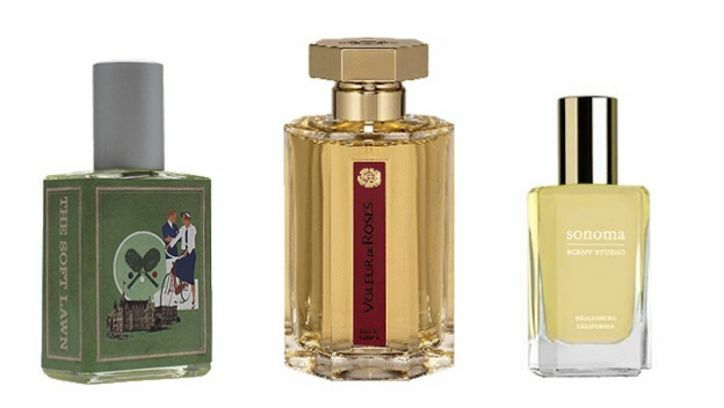 Receive a curated collection of three niche fragrances each month from perfume artists around the world. On the first day of each month, we reveal the featured theme, artists, and fragrances. All month, we post behind-the-scenes stories about the perfumers, their inspirations, and their creative processes while you immerse yourself in their creations. I was intrigued. And besides, they were offering a first month at no cost. Thereafter the charge is $18 per month. At the end of March, I received an email stating that my package had shipped. Then on April 1st, they revealed the three perfumes that were part of the month’s offering. Once you receive your samples, if you decide you want to purchase, you can do so through their website and your $18 subscription fee can be used towards the purchase of the full bottle. I received my package on April 2nd. Let me say that my package came in the most beautiful and thoughtfully designed an elegant box. If you are in the fragrance business, you need to ensure that your packaging lives up to the luxury aspects of the fragrance. Olfactif did this to perfection. Once you opened the box, there was a perfectly fitted card that provides the theme of the month’s collection. For April it was Vignettes of Spring, a collection of fragrances that are meant to brighten the days after the dark days of winter. I loved the theme, I loved the packaging and I was lukewarm about the fragrances except for Velour de Roses which really was a nice surprise as it’s not a sweet rose, but one that’s more earthy and woody and one that does invoke the smell of springtime earth. But for some reason I felt cheated. Why? 1ml samples come out to be around $6 a piece. Why couldn’t they have provided 2ml instead? I thought that I would be receiving newly launched fragrances. OK, The Soft Lawn was launched in 2012, Fig Tree was launched in 2011 and Voleur de Roses was launched in 1993! Is L’Artisan Perfumeur really a niche perfume company anymore? The prices that were offered on the site were consistent with retail prices, but I found that you could purchase the offerings for lower costs elsewhere. I want a good bargain. Now I’m just sounding like a cranky old man. I should really love this service but I just don’t. Then a comment made by the all-wise Undina of Undina’s Looking Glass was made to me: “This program – while interesting in principle – isn’t for me. Or for you. Or for most other perfume enthusiasts who has been into that for a while.” She is absolutely right. I am too knowledgeable about perfumes and I can direct my own destiny towards sampling and purchasing without the need for a “curator”. It just isn’t the right fit for me. Once I let that thought takeover, I realized that for the right person, someone who is interested in perfume, but knows little besides what Macy’s has to sell, this is a perfect opportunity to get introduced into this world of perfume that we all love already. This subscription comes in a pretty package, with interesting background information and it offers up a world that many do not know about. Perfection! I’m going to give my subscription one more month just to see what they’ll send in May But I know, that if there is a fragrance that I want to try, I can always find a sample through places like Surrender to Chance and other sampling services. And once my subscription is over, I”ll still continue to check out their site to see if anything they are offering tickles my fancy. Good luck to Olfactif, I think that they’re off to a good start. See, I ‘m not so cranky after all! Categories: Uncategorized | Tags: Olfactif | Permalink. I could never do a curated, boxed, montly set of *anything* — not perfume, not makeup, not food (well, maybe food, depending on how high-end it was). Even if I wasn’t a knowledgeable perfumista, I’d never pay for a service like this because I’m too contrary to enjoy getting someone else’s ideas of what’s nice. Or, perhaps it’s that I’m too much of a cheapskate to enjoy not choosing my own things that I *know* I will like. I don’t like the element of gambling with all these subscription services. I value my money too much to toss it on a random selection. As for this Olfactif one, $18 for 3 vials??!?!?!?!?!?!?!?!?!???!!!!!!!!!!!!!!!!!!!!!!!!!!!!!!!!!!!!!!!!!!!!!! PFFFFFFFFFFT! That was my reaction at the time the news of this service first become public but all the additional exclamation marks come from the choice of fragrances that they sent you. 1993??! Pfffffftttt. And, frankly, I don’t care how nicely mini-samples are packaged. They’re samples. They will be fleeting, temporary experiences. I don’t need nice packaging for that. I need a more practical cost. Unless they’re selling you Puredistance or Roja Dove perfumes for $6 a vial, I just have another big PFFFFFFFFFFFFFFFTTTTTTTTTTTT! Bah humbug! LOL, dear K I didn’t mean to get you so riled up. Remember, it’s not for us! I saw the Olfactiv ads, and read your previous post, and thought that it was a good deal, the $18 includes ConUS postage? In Australia ConAus postage would cost around $6.60 alone. Then I thought the packaging must be VERY expensive because it looks elegantly and cleverly designed and produced. My only problem was the 1ml aspect, paying extra for a 2ml spray makes much more sense to me. They are starting a fabulous idea from scratch, I’ll be interested to see where it is in 12 months and how the idea has evolved. Hey P – yes, the $18 includes postage as well. I’ll be interested too as how well they will do. I would love to know who’s behind it. I also saw yesterday that another company, Bergamot, is going to start doing the same thing. I guess there is some money to be made with the business model. I somehow understood this would represent some unknown perfume artist more than something that already exists. You are right, for someone being in a perfume world for some time this is not a service to use. I didn’t look any deeper because I saw they don’t ship outside USA. That being said..how on earth is l’artisan not a niche perfumery?! Well, I guess that L’Artisan would still be considered niche, but large chains like Sephora are carrying them now so their mid-niche??! While I do think there might be a market for this I agree that we are not the target audience. The packaging is nice but I’d rather have a plain padded envelope with a few more samples instead. But that’s just me. I do hope they do well because I love people who love perfume. The packaging looks really exquisite as for three little perfume samples. You’ll do better (and cheaper) by smelling a fragrance in person in store or ordering a sample from decanting services – it’s still better option. The comparison I guess is probably most acutely made with book clubs. As they are generally best for people who enjoy reading novels but not reading about novels, so this service I would imagine is for those who like perfume but aren’t into or haven’t the time to read reviews about it. That said, the price point to quantity relationship probably needs looking at and the choices could be more original. Perhaps I’m just the generous sort, but I say any new product needs time to bed in. Thanks PD…and I have no doubt that if you had such a service it would be amazing! This sounds so promising and I love the business model. I agree with the consensus that this program isn’t a good fit for us experienced or somewhat experienced perfumistas. It is way too expensive . If only we had all the money in the world we could buy what we want and still subscribe to such services. I can only dream! As for Voleur – you’re right it’s not sweet at all. Good lord, I can’t imagine what you 2 could possibly say about me. Should I be scared? I think that the packaging is actually what you are paying for, not the fragrance. Which makes me wonder if there is some kind of corollary: are people more inclined to put the $18 towards a full bottle if the samples come in a beautiful box? I tried Birchbox, or something equivalent to it a couple of years ago. The anticipation of what I’d find in the box that month was always better than what I actually got. I gave it a few months and nothing truly spectacular ever came out of it, so I stopped. I get the feeling this would be the same kind of experience for me. The packaging for this does look beautiful though! I’m letting this slide for one more month and then I’ll probably let it go. And yes, the packaging is beautiful, they did a really nice job on presentation. Just a “buyer beware” – it doesn’t matter how many months you initially purchase. The Olfactif company will keep charging your card until you actually e-mail them to cancel your “subscription”. 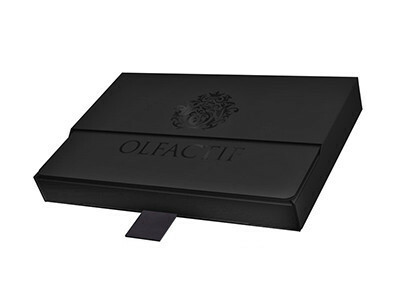 Keep in mind users do not have an account on Olfactif so it is not so simple as hitting “cancel membership,” nor do they give you any impression when you place your order that you will be charged after your initial order (in my case, 3 months) ends. Despite it being a fun service I find their billing practices very deceptive and unethical.